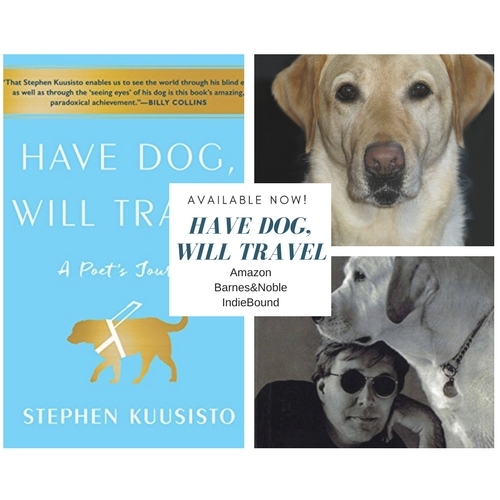 A book about a blind man getting his first guide-dog? Why was I picking this up. It was on the Rapid Reads shelf at Petit Library and I had picked it up each of the last three times I had visited. Something about the cover, the title, the idea was grabbing me, but I resisted thinking it a light book while I was in the mood for something heavier. Something in that fourth time picking it up got me. Maybe it was Billy Collins' blurb, but probably it was me finally giving in to my instincts. It was not a light book. Nor was it too heavy. It weighed in just right. Kuusisto is a poet and writes prose like one. It is good prose with the occasional moments of poetic intrigue. A sentence is phrased in an odd way. Maybe it's broken, a fragment but placed just so. Whatever he has done, it works here and he led me through the story surely and firmly. A book about a blind man getting his first guide-dog? Hardly. It was the story of a man bonding with a partner, falling in love, becoming an independent man, alluding to the forces that had shaped him, and accepting grace. It is, simply put, a good book. A few choice lines, but only a few. I found that I was reading more than harvesting. I was too involved in the story to stop and take note. I'm hoping that these three work out for me. I'm sad at my job and need to learn how to go back out into the world of uncertainty. For that getting across, I just need to get across. And while I believe that I might get what I need when I stop wanting it, I also believe that working is true wanting and that work will get me there. Okay, that line has reshaped my life just a bit. Or maybe it has altered my trajectory by a tenth of a degree. Either way, I'm grateful for it. This is a Zen koan. I'll be thinking about it for years. I've ordered the rest of his prose from the library and will then move to his poetry. Maybe I might even write him a note since he lives right around the corner. I'm in proximity to good writers. How great is that?